Send us a Shout-Out and share the love. Shouts will go on the air beginning 02/14/2019. Wait for the tone and speak your shout-out into the recorder, it’s that easy. (Please remember our transmissions are governed by the FCC and foul language is not permitted). 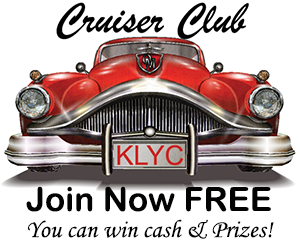 Let us and everyone know how much you love KLYC The Cruise and our programming.